I am writing to ask for your support for Keith Henderson. Keith is a longstanding, loyal and active supporter of the Labour Representation Committee and Momentum. 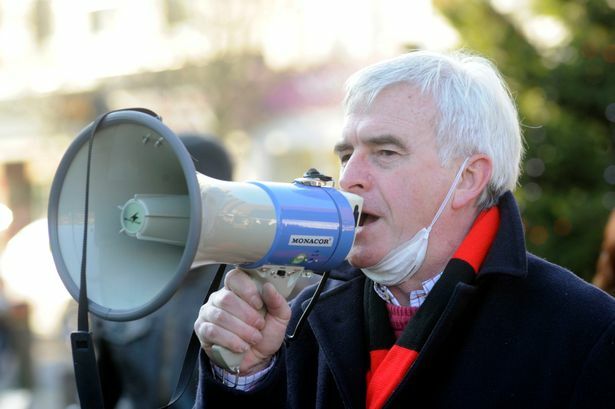 He has an excellent record of campaigning for the Left in the Labour Party and the trade union movement. On 2013 am Employment Tribunal judged that Keith had suffered unlawful direct discrimination by his employer, the GMB trade union, on the basis of his left wing democratic socialist beliefs. The GMB successfully appealed this decision and the case is now back in court this week. I have tried to secure a resolution to this dispute by agreement but with no success. Keith is now facing a possible bill of up to £15,000 to cover legal costs. Keith is a low paid worker and is worried that this will put him and his family at risk of losing their home. I am writing to ask you if you could help Keith by making a donation to his appeal and/or asking your Labour Party or trade union branch to contribute to this appeal. It is important that we stand by someone who has stood by our movement in solidarity. This conference notes that LRC member Keith Henderson and his family face homelessness as the result of a legal battle he has been involved in against the right wing bureaucracy in the GMB trade union arising from the fact that he put left wing social democratic principles into practice. Keith was victimised for carrying out the democratic decision of GMB members of the House of Commons branch who had voted to put a picket on the Houses of Parliament on the day of action of the public sector pensions dispute on 30-11-2011. This action incurred the wrath of GMB General Secretary Paul Kenny who shouted at Keith for being too left wing after receiving a call from the Labour leader’s office. Formerly Keith was dismissed for alleging that leaders of the GMB union were colluding with right wing elements in the Labour party to prevent him, as a working class left wing activist, from progressing in the movement. However, despite deeming that the dismissal was fair they also concluded that Keith had been discriminated against because of his left wing socialist democratic beliefs. This has now been enshrined in law as a protected characteristic of philosophical belief under the 2010 Equalities legislation introduced by a Labour government. Conference therefore resolves to make every effort to assist in raising the money to pay the court costs in this case, which the GMB are pursuing him for and may amount to £15,000, making him, his aged parents and his dependent brother homeless. I have just received nominations for GMB executive council by election. Given the GMB’s executive being right leaning in their politics. Does anyone know which candidate to vote for?